The price of gasoline continued to fall during the past week, according to the latest survey from the U.S. Energy Information Administration. The weekly E.I.A. fuel price survey shows the average price of a gallon of regular unleaded is now $2.04, down about three cents from last week. However, the more weighty price declines that have become weekly faire at retail gas stations is slowing. In fact, prices increased in two survey regions, the Midwest and the Gulf Coast. For drivers across the nation’s midsection, fuel costs nudged upward about two cents per gallon, while prices were up about a penny per gallon along the Gulf Coast. 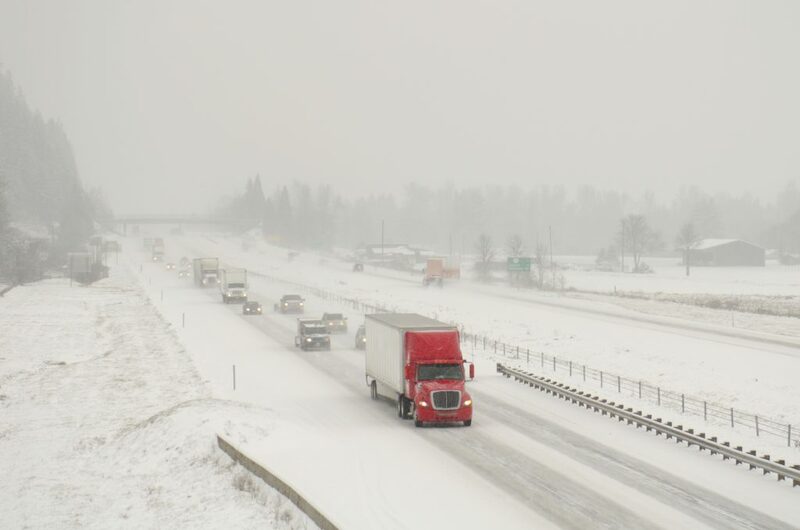 That price increase offset large declines seen along the West Coast, where prices fell another seven cents per gallon during the past week. However, when you factor California into the West Coast, prices only went down about a nickel per gallon. Prices were down about five to six cents across New England and the Mid Atlantic States, and there were much larger declines seen along the Lower Atlantic States, where the average price for gas is now $2.17. The cost of diesel fell at a more robust pace, compared to its unleaded counterpart, although price declines for diesel have also begun to slow considerably. 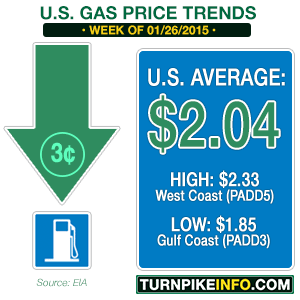 Prices dropped about seven cents over the past week, slipping to a $2.87 national average. The lowest costs were found across the Gulf Coast and Midwest, where prices were averaging $2.79 and $2.80, respectively. The cost of diesel in much of the New England and Central Atlantic regions remains above $3.00 per gallon, as do prices in California. The broader West Coast region is enjoying prices down at $2.76 per gallon. The price of crude oil continues to remain depressed, both on foreign and domestic exchanges. West Texas Intermediate was trading down on the New York Mercantile Exchange again Tuesday morning, this after attempting to level off during the past week. Prices were down over two percent in early trading. WTI is the domestic crude benchmark. Meanwhile, Brent Crude was trading down slightly in trading on the Intercontinental Europe Exchange, where futures contracts continue trading below $50. The decline in both Brent and WTI has resulted from the glut of oil, both due to high production by Middle Eastern nations, particularly Saudi Arabia, and by the tar sands and shale boom in the United States and Canada. The decline in demand overseas, due to a slowing economy, has also contributed to the precipitous decline of crude oil prices.